When the trailer for Thor: Ragnarok arrived, it made a bold statement. Opening with a seemingly incarcerated Thor, it moved quickly to a shot of Hela, Goddess of Death, effortlessly crushing Mjolnir with one hand. The snippet of footage left many wondering how the God of Thunder might manage without his trusty hammer. Well, we need worry no more, because Mjolnir has now been spotted on the set of Avengers: Infinity War, and it’s all in one piece. As the film was shooting in the imposing and iconic Durham Cathedral in the North of England, eagle-eyed fans were keenly spotting details and sparking speculation. This one, by contrast, comes from the directors themselves – Joe and Anthony Russo. 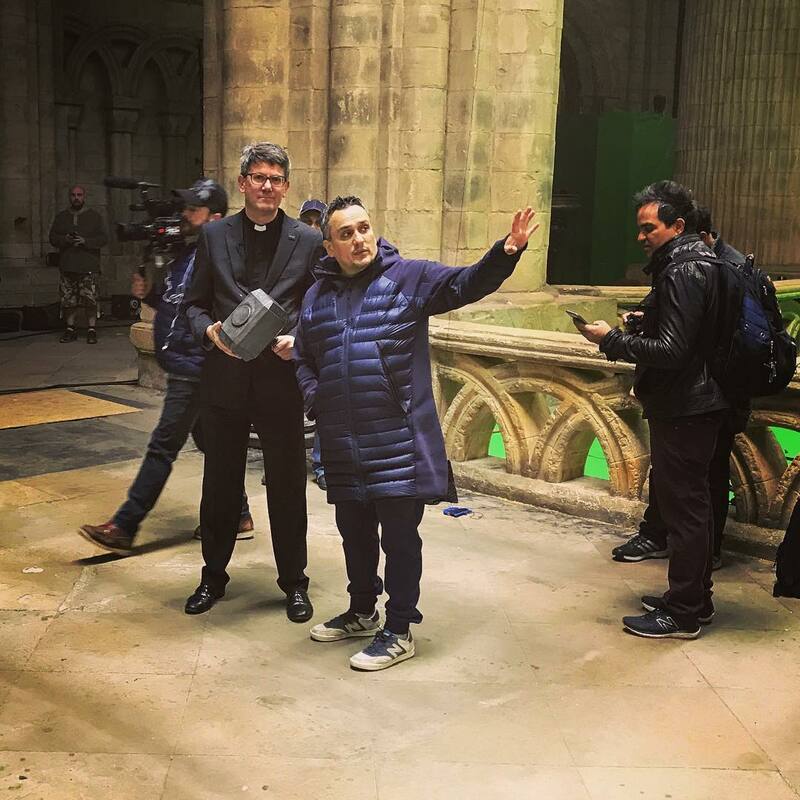 Sharing the image on their Instagram page, the filmmakers show us Joe setting up a shot inside the Cathedral, while a priest stands next to him holding Thor’s hammer. As the internet melts down, wondering if Durham Cathedral is standing in for an Asgardian building – and if so, why there might be a priest in the scene – we can confirm that the priest in this shot is indeed The Very Reverend Andrew Tremlett – Dean of Durham. As for the nature of the scenes that this World Heritage Site will be involved in, director Joe Russo confirmed to the Cathedral blog that it will indeed be standing in for something else – as opposed to the action actually being depicted as occurring at Durham Catherdral. So, Mjolnir will be seen in a grand, imposing setting in a significant portion of the film. It seems that – either in flashback or otherwise – Avengers: Infinity War might indeed be taking us back to Asgard. We will find out for sure when the movie arrives in cinemas on May 4th, 2018.